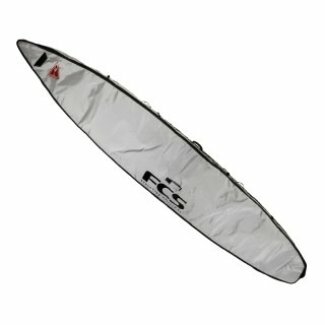 Protect your board from dings and scratches on your way to the waterfront with FCS's Racing Cover SUP Board Bag. With 5mm high density foam, reinforced tip and tail, and a corrosion resistant marine zipper your board stays safe and secure. Dial in the fit with 8 compression cinches. If you have any questions about this product by FCS, contact us by completing and submitting the form below. If you are looking for a specif part number, please include it with your message. Ocean and Earth Barry Basic Silver SUP Board Bag - 10'6"